There was a pleasing balance between the white, blue and purple perennials. The silvery border of artemesia anchored on either side by French lavender, the elegant spires of snapdragons, and at the back on either side of the clematis, Russian sage. They would stretch the bloom period into fall. Clematis are bluish, pinkish, reddish. After some hail, they’ll look quite deadish. 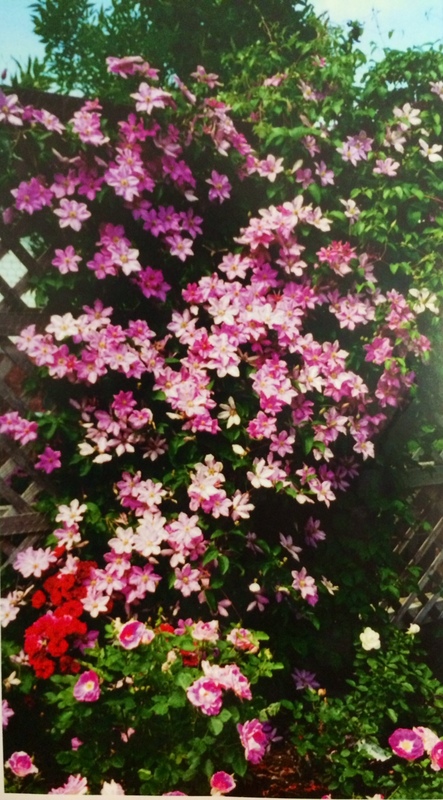 Clematis is the queen of climbers; every garden should have several of these beauties. Their colors are entrancing; pink, red, purple, mauve, and white. If treated well, they will bloom with vigor and reliability. This lustrous climber is a rampant grower, though it will take a few years before it starts ramping. 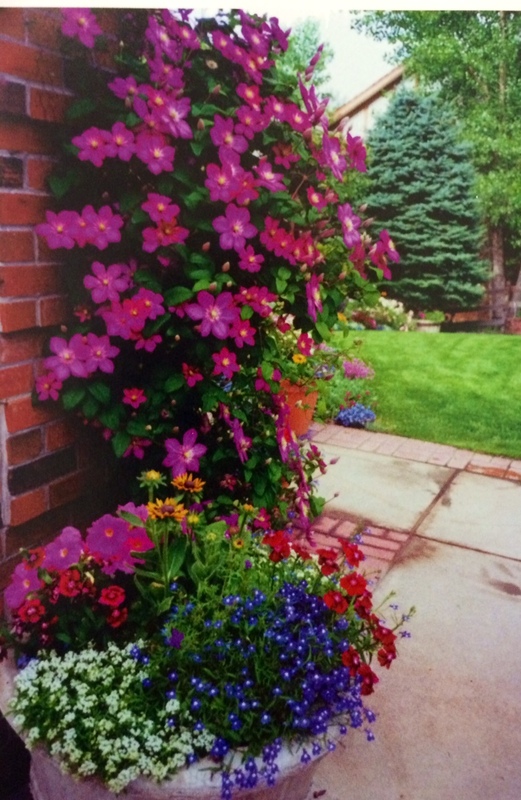 It’s a carefree plant and once established for two or three years, all that is required in spring is fertilizing and a good supply of water. Plants can be like friends and relatives; initially, they are eagerly awaited and made welcome. However, after a prolonged stay, some become tiresome and one longs for them to go. There are others like clematis that are much anticipated; their presence enchants us, their departure leaves a void. Choose the right site. Check the tag for this information. Prepare the planting hole with compost and manure. In spring, prune those that need pruning. Don’t worry if you forget to prune, they’ll still bloom. Never allow the plant to dry out. In the spring, fertilize and guide the tendrils onto their supports. I use a lot of chicken wire fixed either to a wall or fence. You will be rewarded with a gorgeous display of shimmering color from this most obliging plant. “Sweet Autumn,” which are small delicate white flowers that flower late.